This concert will feature Paul Livingston, Daniel Miller, myself and James Tradgett playing a quartet of instruments called the “Sherlock Quartet”. These four instruments, 2 violins, a viola and a cello, were made by Steve Burnett from a 200-year old sycamore that stood in Arthur Conan Doyle’s childhood home in Liberton, Edinburgh, which he is said to have climbed as a child. 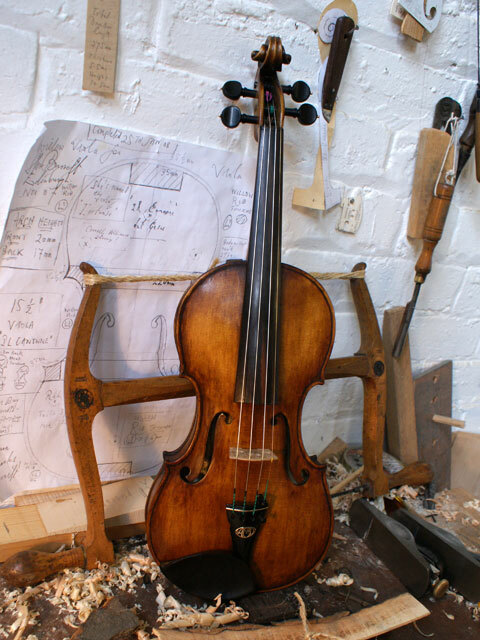 The “Sherlock” violin was made by Burnett to celebrate the 150th anniversary of Conan Doyle’s birth and you can hear Paul playing it on Radio Scotland if you’re up early and tune in between 6.30am and 7am! I am playing the dramatic and beautiful Hindemith Viola Sonata Op 11 No 4 with Audrey, and Jean Murray with play the Hindemith flute sonata, again with Audrey on piano – a celebration of Paul Hindemith’s works! Mozart’s elegant Duo in B flat for violin and viola plus the showy Halvorsen arrangement of Handel’s G minor Chaconne and other pieces tbc. Hope to see you at one or more of these concerts. Thanks for your support. This entry was posted in Concerts and Events, News, St Andrews Music, String quartets, viola playing, Viola recital and tagged Beethoven string trios, Chamber music, concerts, Greyfriars Kirk edinburgh, Hindemith viola sonata, Reid Hall, Sherlock quartet, Viola and piano recital on October 19, 2013 by jesswyatt. All pieces performed by current or past members of the Heisenberg Ensemble, in aid of the 25th Anniversary Fund. Admission free but retiring collection with be taken, Refreshments available from 12.15pm. This entry was posted in News, St Andrews Music, Uncategorized, viola playing, Viola recital and tagged Chamber music, concerts, Fiddle tunes, inspiration, Inspiring change, live music, Lunchtime Concert, Scottish traditional Music, St Andrews, Viola recital on August 28, 2013 by jesswyatt. Friday’s lunchtime concert in the University chaplaincy promised much, and delivered even more. It was given by the duo of Jessica Wyatt on viola with Audrey Innes at the piano. Composed in 1849, when technical improvements had made the French horn an instrument with new possibilities, Schumann’s Adagio and Allegro is a delightful work, the second part of which is full of joyous whoops referring back to the horn’s hunting origins. It has often been adapted for other instruments, and, perhaps surprisingly, it seems to suit the viola perfectly. The sound is completely different, perhaps without the effervescence of the horn version, but with a rich sound more akin to later compositions of Brahms. The performance by the two artists brought out all the extra lyricism encouraged by the use of a stringed instrument and the slower pace. Paul Hindemith, like many composers, fell out of fashion after his death. Even after half a century performances of his music are rare. The fact that much of it is attractively lyrical told against him when modernism was the fashion. He played a number of instruments to a high standard, and led the Frankfurt Opera Orchestra until war service. But he seems to have had a particular affection for the viola, switching to that instrument when he returned to civilian life after the First World War. His Viola Sonata, composed in 1919, is a superbly demanding piece, full of seriously testing music for both players, and it received a thoroughly enjoyable performance here. This entry was posted in Classical Music, Concerts, performance, Reviews, viola playing, Viola recital and tagged Chamber music, concerts, Dundee Courier, Hindemith, Lunchtime Concert, Reviews, Schumann, Viola recital on April 5, 2013 by jesswyatt. Lately I’ve been working really hard preparing for a couple of lunchtime recitals that are coming up soon. As before, I’m playing with Audrey Innes, a pianist who teaches at St Andrews Music Centre and with whom I have played for a number of years – I hesitate to call her my duo partner, as she regularly plays with many others and is in high demand. Anyway, this time we’re playing a programme of Schumann’s beautifully lyrical Adagio and Allegro (originally written for horn), paired with the fiery and powerful viola sonata Op 11 No 4 by Hindemith (himself a viola player). These are both highly romantic works, with the Schumann written in 1849 and the Hindemith in 1919 but displaying many backward looking features as well as forward looking ones such as whole tone scales. This is the first time that I am doing more than one recital of the same programme – I don’t want to call it a series, as it is only 2 concerts, but still! It is also the first time that I will have one of my concerts recorded professionally – the father of one of my pupils is a recording engineer, and he has kindly offered to bring some of his students over to record the St Andrews concert, which is very exciting but a little nerve wracking! Hope to see you at one of them! This entry was posted in Classical Music, Concerts, gigs, News, performance, St Andrews Music, viola playing, Viola recital and tagged Chamber music, concerts, Dundee University Chaplaincy, Hindemith, Lunchtime Concert, Schumann, St Andrews, St Andrews Music centre, Viola recital on February 15, 2013 by jesswyatt.